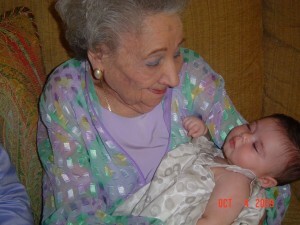 On December 16, 2009, my mother, Goldie Goldberg Fastman, passed away. For the past several years, my mom’s health needs and her wellbeing were an integral part of my existence. Finding an appropriate retirement community, securing the best health care and worrying about her happiness, was what I did without even thinking about it. It became how I knew myself. Now I face the end of an era. And, I know my own life will never be the same. Mourning is a slow uneven processs. I understand that I am in the earliest stages. In order to honor my mom’s memory, I plan to explore new ways to help other caregivers to care for their parents. I know that contributing to others is how human beings come to terms with life’s losses and begin to heal. Elder Connections is developing The Caregiver Lifeline, to honor the memory of Goldie Goldberg Fastman. We look forward to presenting this lifeline to you in the coming months. I would like to share my mom’s Eulogy with you. Please share your comments with me as I face this difficult time. When I think about sharing the essence of my mom’s life, what first comes to my mind is her presence. When she was in the room, she never sat on the sidelines. Goldie was a player with a mind filled with thoughts that begged to be shared. Whether it was her pronouncements and opinions or her deep and abiding pride in her family, everyone knew where she stood. She loved living life, relished relationships, travel and anything involving interfacing with people. Recently, she told me how much she has helped her dinner partner at their retirement community by trying to get her to look at life differently. She was recently asked to assist the nurse practioner at The Watermark. Goldie performed for a class of nursing students by following a script which depicted her as an “old person.” I was told what a natural she was and that she would be hired again due to her stellar performance. That did not surprise me. She had performed many times before at her travel club to rave reviews. Goldie was at her best when she was being fully expressed. There were the things that she did in life – bookkeeper, poker player, performer, a wife twice, mother, mother-in-law, grandmother and great grandmother. Her love for my dad, Max, was one of fierce devotion. And her second husband, Mort, was an undeniable bonus and delightful surprise. Their relationship inspired all of us to know that life can provide us with unexpected possibilities that we could never make up on our own. But, what impacts me most is not what she did or her roles in life, it is who she was being and the profound affect it had on those who lived in her world. There are many Goldie stories to share. I spent alot of time making them up myself. But, what I know is that out of these stories, I created who I am. Out of these great, dramatic, sad, joyful stories, my children were supported in creating who they are in life as well. When her grandson, Adam, learned that his grandmother’s health was failing, he ran to be by her side. He created a legacy for all of us, but especially for her great-granddaughter, Alexa, by interviewing his grandmother and producing a CD of the story of her life. What propelled him to do this interview as gifted to him by who his grandmother had been for him. When Goldie moved into her retirement community six months ago, she required support to live there. When I shared this with her grandson, Brad, he offered to provide the resources she needed without hesitation. This generosity and love was gifted to him by who his grandmother had been for him. Brad also initiated a most momorable evening at her retirement community just three weeks ago. He wanted his grandmother to have a new friend. Brad’s brother-in-law has a grandmother who had recently moved into the community. Brad coordinated a dinner there with much of the family and extended family present and it was a spectacular event. But, what will always remain with us is the picture of Goldie strutting through the dining room, taking off with Alexa in her stroller. Goldie was presenting Alexa to her world for everyone to see. It was as if she said, “This is my great-granddaughter. Look upon her and see my future. Look at what is part of me.” The expression of pride and unbridled joy will always be imprinted within us. My husband, Dan, became her son; his family embraced her with their huge Italian hearts as their own. And, the Fastman family kept her close to them even though she had only been married to Mort Fastman for ten months and seven days. My mother was a person of determination, pride and fun. And the ripple affect of her being in her life can not begin to be measured. Goldie’s work in this life has not ended. We will continue to invent ourselves out of her presence in our lives. What a gift to be cherished and to remain ever living in our hearts.